Drawout Panel Accessories/ With drawable panel accessories are in direct contact with the vertical bus-bars. The power contacts are available in ratings from 63A up-to 400A. The Power contacts are tested from mill-volt drop & temperature rise at C.P.R.I. Laboratories. Sunesons has recently developed a new set of main power contacts with a swivelling rear link, which makes it convenient for use in power feeders that have bus bar connections to be made between the pore contact & the switchgear. These contacts are available in a ratings of 100A to 630A. They are tested for mill-volt drop & temperature rise at C. P. R. I laboratories. Spring-loaded, tin/silver plated main power contacts are provided for both the incoming as well as outgoing side main circuit connections. 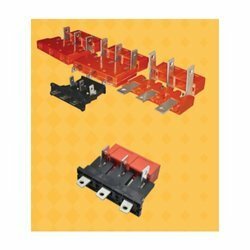 Looking for Drawout Electrical Accessories ?